The incredibly scenic horizon at Paiute’s Sun Mountain course is equal parts relaxing and distracting. Las Vegas has a well-known way of presenting everything in and about Las Vegas to its out-of-town visitors. The City, and more specifically The Strip, is all about bigger, louder, brighter, flashier, better. Another characteristic of the City is that it’s a place that loves to boast and sell the dream of “what if,” though very few of those dreams and self-aggrandizing fantasies ever come true. The gritty reality of “What Happens in Vegas” is often much more drab and sad. Each time I visit Sin City, it takes at least half a day to adjust to the Total War assault on all of my senses: the lights, slot machine jingles, the traffic, the sterilized air, all of it. 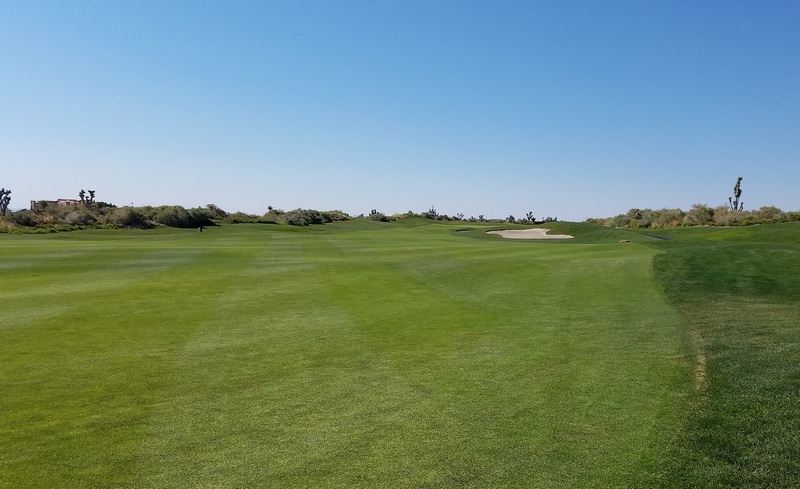 For a course sitting on the desert’s valley floor, the course has a sneaky amount of elevation change in play, which only added to the intrigue and challenge. Perched against this backdrop is the Paiute Golf Resort, a completely antithetical escape from everything Las Vegas. 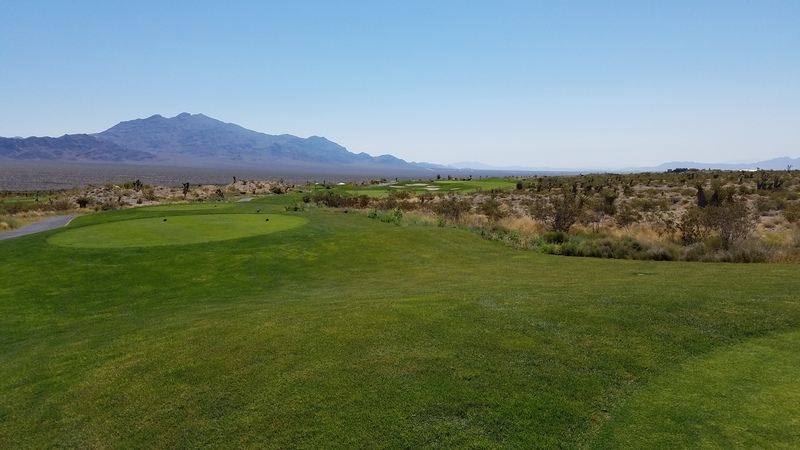 Perhaps that’s why I absolutely fell in love with the Paiute Resort, because it provides a few hours of golfing serenity, with the only distractions being the natural beauty of the mountains and the desert. 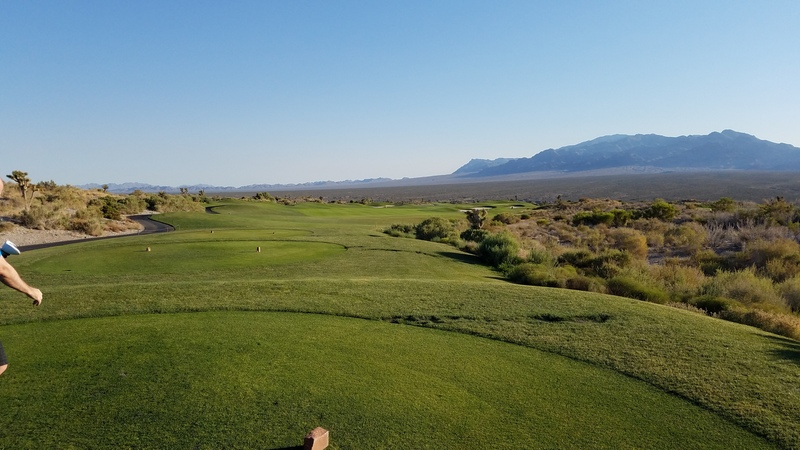 Simultaneously, the horizon is dominated by majestic mountain peaks on three sides, including spectacular views of Red Rock Canyon, Charleston Peak, and the “Sun Mountain” for which one of the courses is named. There’s nothing comfortable about many of Sun Mountain’s tee shots, like the 5th hole here. The rest of the landscape surrounding the turf playing surfaces was left to its collection of native scrub grasses, rocks, and the occasional cactus. Set on the valley floor between the mountains, wind was a constant but welcomed element of the course on our sunny, hot June morning. The wind kept the heat down for 15 holes, providing a merciful stay of execution to the mildly hungover contingent of our group. The second-built of the three 18-hole courses at the Paiute Resort, Sun Mountain was designed by Pete Dye and opened for play in 1996. In typical Dye fashion, Sun Mountain is a tough course relying on visual deception, intimidating angles, and lots of bunkers. Sun Mountain got creative to incorporate Pete Dye’s signature exposed timber supports around the 6th fairway bunkers. 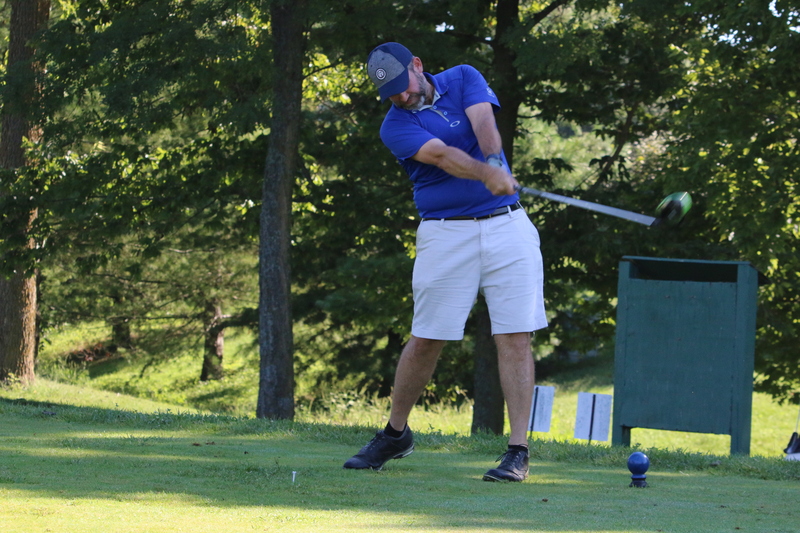 The result is a course that puts the golfer to the risk-reward decision on most holes, with a few tried and true Dye template holes included that felt familiar, if not comfortable. In fact, the course incorporates several Dye design staples, such as using large, exposed landscaping timber around several bunkers, generally large, multi-tiered greens, and several iterations of a Cape hole, using sand, native areas, and even a large pond on the 18th hole to make a golfer pick their line of attack carefully. 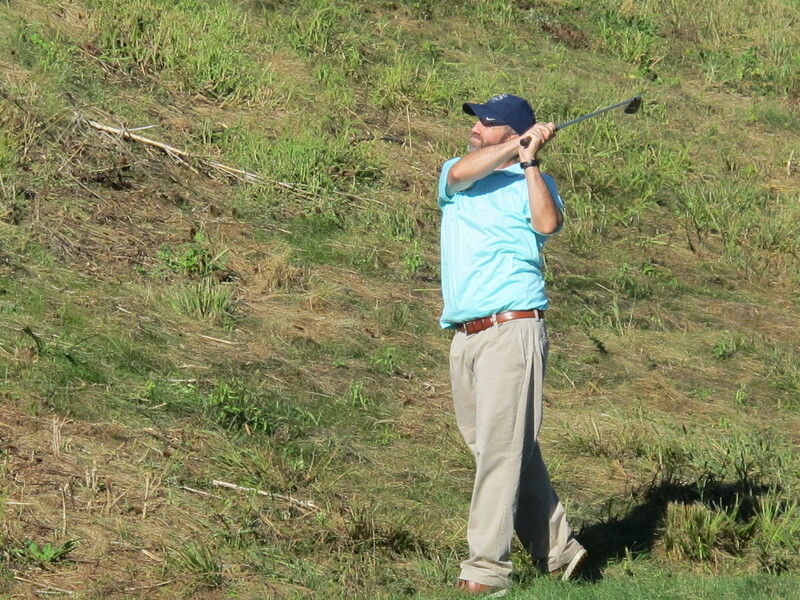 With a course rating and slope of 73.4/140 from 7,112 yards, the tips can’t be any fun except for an expert golfer. 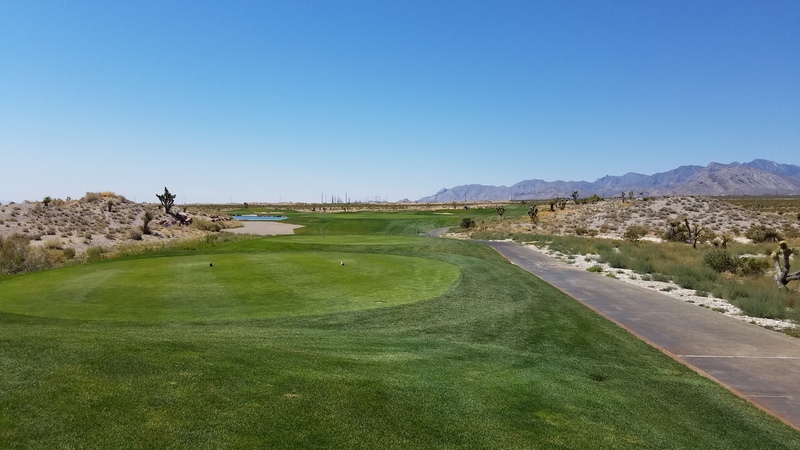 Our group battled out one tee forward (Gold) from which Sun Mountain plays to a rating and slope of 71.2/128 at 6,631 yards, albeit, at 2000 feet above sea level. There’s no such thing as a straight forward shot on the Sun Mountain; the course always gives you something to think about. 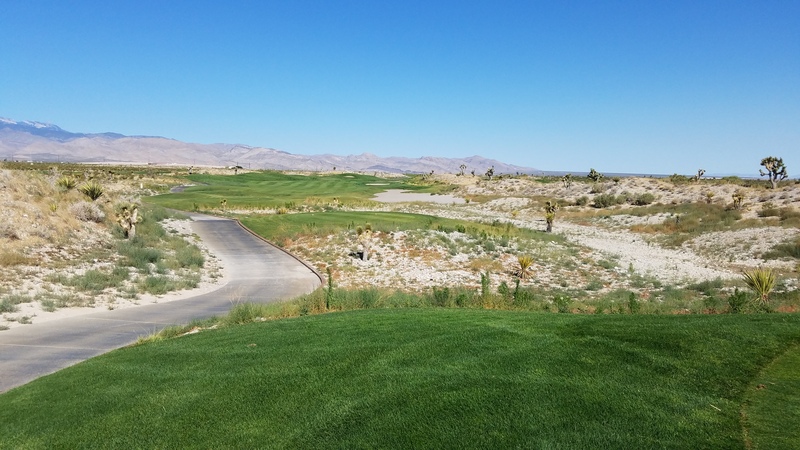 Despite being in a sun-drenched corner of the Nevada desert in the middle of summer, the golf course was in great condition during our visit. The beautiful emerald fairways, greens, and roughs truly sparkled against the rustic native areas and dramatic horizons. We found the wonderfully lush fairways a little narrow on the Sun Mountain course, especially for a resort golf course, which made for a difficult day of driving the ball. Playing out of the rough was manageable, but the native grass areas proved utterly unforgiving (and ate a lot of our group’s golf balls). The green complexes were in as wonderful condition as the rest of the Sun Mountain course, with uniformity of speed and appearance. As mentioned above, the course’s greens had a familiar feel because I play a lot of golf on Pete Dye-designed golf courses. The 10th green looks benign enough from a distance, but there are evil little, subtle breaks all over the place on the putting surface. The greens aren’t “copies” of other holes or templates per se, but the greens’ surfaces are large and full of contours, shelves, and subtle undulation. Thus, it’s simply not good enough to make it to the green, but one needs to be in the correct side or portion of the green. There’s not much easing into the round on Sun Mountain. After a stern but benign opening hole, at a mere 356 heavily bunkered yards, the second hole presents the first of many tough risk-reward (or in our case risk-punishment) decisions on the course. 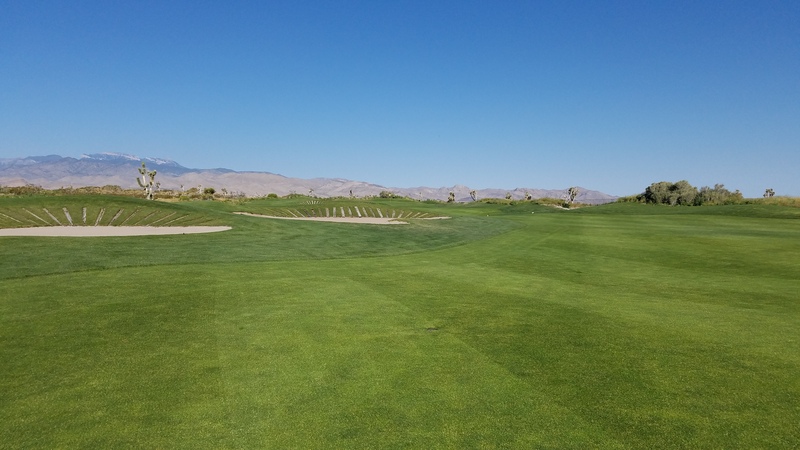 About the time you acclimate to the desert and mountain scenery, the course routing on the front nine kind of beat us up, with the side’s two really tough par 3 holes immediately following the long slogs that are the front nine’s par 5 holes. As demonstrated with the view from the 11th tee, Pete Dye is the master of making a golfer uncomfortable. I thought the long, tough 4th hole was probably the best hole of the first nine. It is a 184-yard, par 3 version of the Cape hole requiring the tee shot to carry a lake to go directly at the center or right side of the green. There’s a shallow bail-out area short and left of the green, though the native areas are close behind the bail-out zone to punish those that take enough club to reach the green but just pull their shot left. Typical of many Dye designs, the 4th hole will severely punish a poorly struck or poorly thought-out shot, but a relatively simple par awaits the aggressive player brazen enough to challenge the pin and execute their best effort. On the back nine, two holes stick out in my memory. The 338-yard 15th hole is a wonderful short par four hole. The 15th hole gives a golfer the choice of danger early or danger later, which I think makes for a fun short par four. A collection of punitive bunkers bisect the fairway, forcing the golfer to decide whether to take the chance to drive the ball up near the green on the upper shelf, bringing both the bunkers and the desert into play, or lay back from the bunkers on a lower shelf below the green. The kicker is the green is positioned to accept a shot from the more aggressive line, leaving an incredibly difficult and awkward wedge shot from the lay-up area to reach the green. It’s a brilliant hole that I suspect would be more fun to play on each successive attempt. The closing 18th hole must be one of Pete Dye’s favorite hole templates, because it instantly felt familiar as soon as we approached the tee box. In strategy and dimensions, it is almost an exact copy of the 18th hole at Heron Point, where I’d played only a month before. There’s more room in the fairway than can be seen from the tee, but an approach from the rough or desert towards a well-protected green is no picnic at the closing 18th hole. At Sun Mountain, the 18th hole is dog leg left with water guarding the entire left side of the hole and trouble in the form of bunkers and desert if a golfer bails out right. 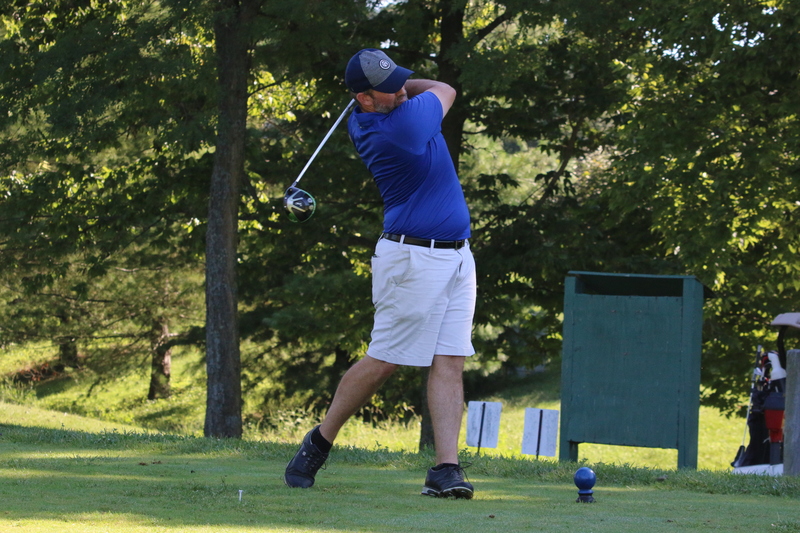 The angle of the hole is reminiscent of the iconic 18th hole at Pebble Beach, where the hole can be won or lost on the choosing of a target from the tee. Playing the hole out to “safety” on the right side of the hole makes the approach more difficult. If one plays to the right side of the green and misses, then you’ve got a chip or a pitch back towards the water. 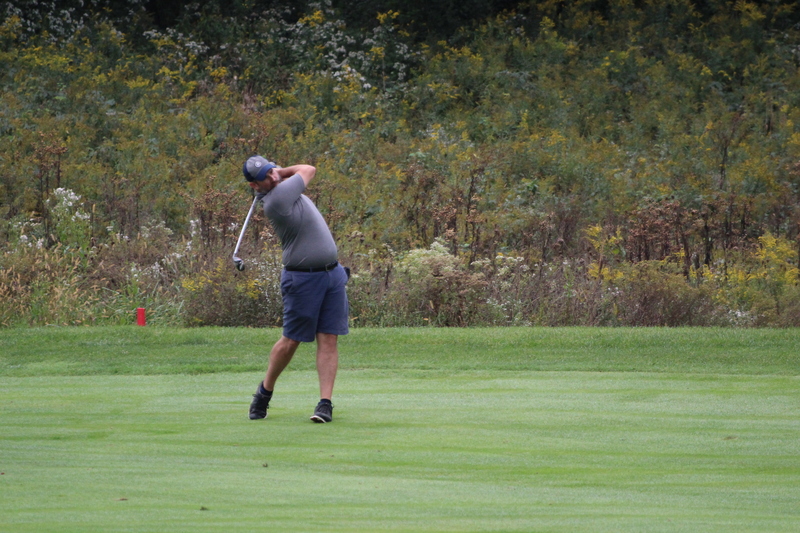 It’s a tough finishing hole, but if it’s played well, there’s a sense of accomplishment and satisfaction. Frankly, just having a birdie putt is satisfaction enough and its own victory as the round comes to a close. Seriously, how can you not smile at these ridiculous jackrabbits, with their goofy long ears and incredible strides. One of the unexpected bonuses of visiting the Paiute Golf Resort is that wildlife was abundant and not shy about being seen. 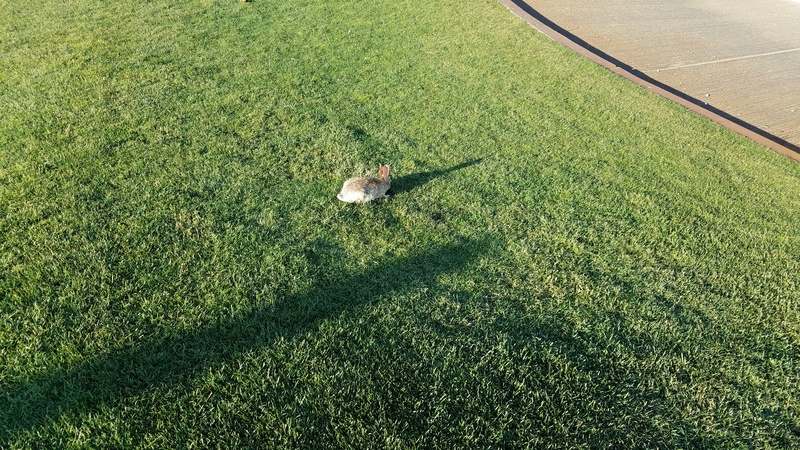 There were roadrunners and jackrabbits EVERYWHERE on the property, especially on the practice range and around the edges of the playing surfaces. It’s hard not to smile when you see a roadrunner scurrying at full speed across a fairway. Seeing a hawk chasing a roadrunner for their bounty of lizards and small critters. 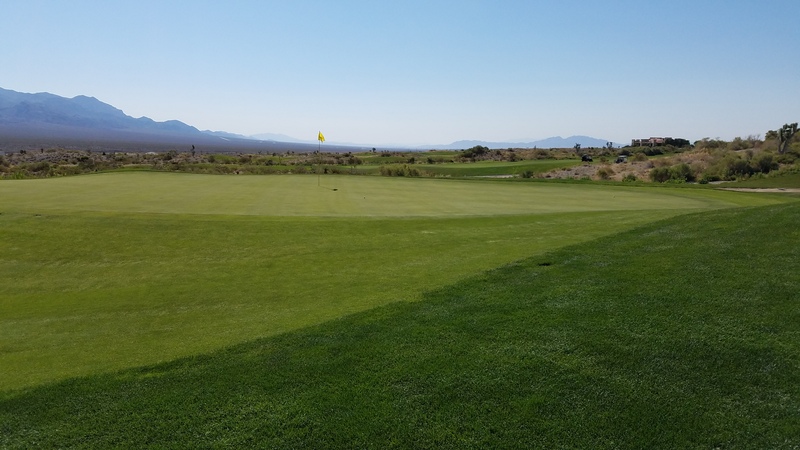 Finally, the staff at Paiute deserve a special mention for being fantastic. 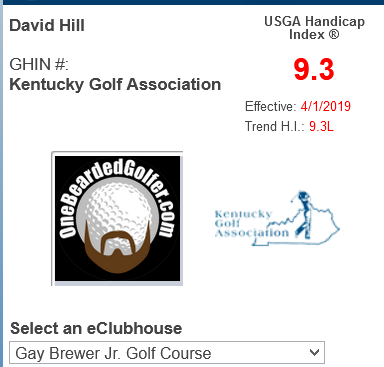 I was supposed to play back-to-back days, which would’ve entitled me to their “Bounce Back” rate, but missed my first round due to a flight being cancelled (thanks Allegiant). Nonetheless, the staff honored my discounted second-day rate for our entire group. 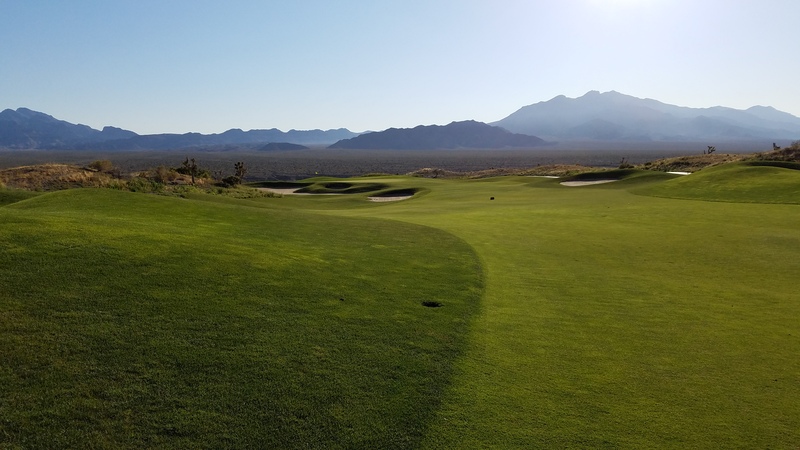 With a panoramic view of the desert, Paiute’s Sun Mountain course may be the most relaxing place in Las Vegas. It wasn’t a ton of money, but the staff would have had every right not to do something that nice for us. Instead of being sticklers, they made us feel welcomed and appreciated, something that I won’t soon forget. 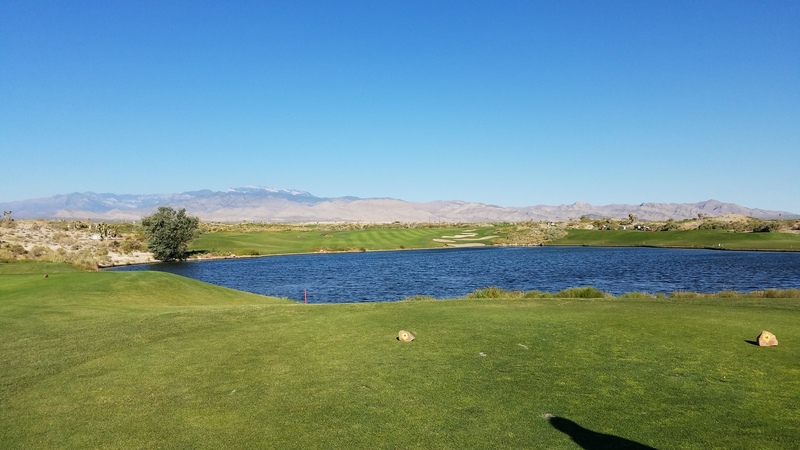 So if you’re heading to Vegas and want to take a little golfing break from the glitz and commotion of The Strip, I can’t recommend a short trip out to the Paiute Golf Resort to play Sun Mountain strongly enough. I can’t wait to get back there to attack the Wolf and Snow Mountain courses and will be doing so very soon. Nice write-up, the course and views look stunning. You sum up Vegas perfectly, and while the hangovers usually factor in significantly on Vegas golf trips, a 4-5 hour reprieve from the chaos is a great way to get over them. Fantastic! 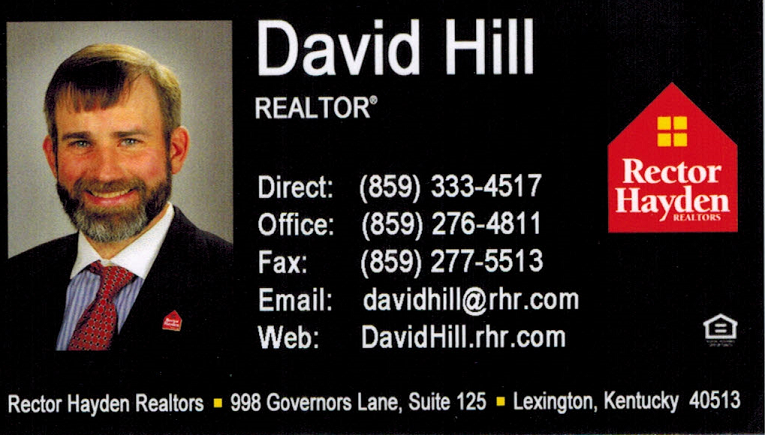 Looking forward to the reviews. Play well.